Gelatin is a translucent, tasteless solid substance made from the collagen inside animals' skin, bones and organs. It is used in cooking as a gelling agent. Gelatin is a translucent, colorless, brittle (when dry), nearly tasteless solid substance, derived from the collagen inside animals' skin and bones.Gelatin is typically produced in a powdered or granulated form. Slightly yellow to light tan in color, it is a rather tasteless and odorless substance. Choosing: Choose the type of gelatin. Contrary to popular belief, there are many types of gelatin available in the market. The most popular kinds are the powder and granule gelatin. Buying: Gelatin can be find at the local supermarket in the baking products. Procuring: One of the most commonly overlooked items is gelatin. This substance comes from ligaments or bones of livestock, and is in a number of food and household products. These include candle wax, fruit gelatin, film, vitamin pills, and many types of candy. There are a number of alternatives such as seaweed, fruit pectin, and cotton gum. 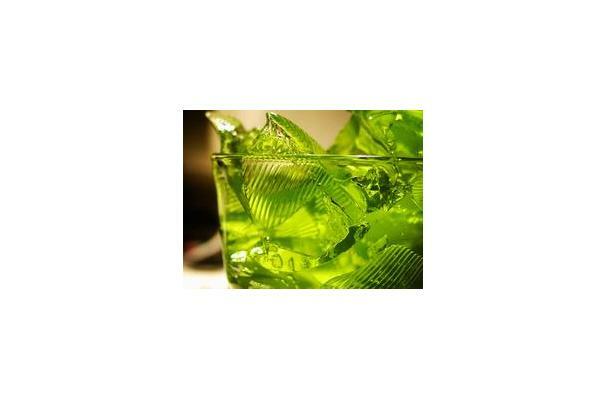 Probably best known as a gelling agent in cooking, different types and grades of gelatin are used in a wide range of food and non-food products: Common examples of foods that contain gelatin are gelatin desserts, trifles, aspic, marshmallows, and confectioneries such as Peeps, gummy bears and jelly babies. Gelatin may be used as a stabilizer, thickener, or texturizer in foods such as jams, yoghurt, cream cheese, and margarine; it is used, as well, in fat-reduced foods to simulate the mouthfeel of fat and to create volume without adding calories. Gelatin should be stored in a cool, dry place. This product can be kept for 3 years as long as containers are kept tightly closed. Most people think of Jello when hearing gelatin. Nearly everyone has a holiday memory that has a jello salad at the table. History: By the 1840s, however, some producers were grinding the set gelatin into a fine powder or cutting it into sheets. One of them was Charles B. Knox, a salesman from Johnston, New York, who hit on the idea of making gelatin more convenient after watching his wife Rose make it in their kitchen. Knox packaged dried sheets of gelatin and then hired salesmen to travel door-to-door to show women how to add liquid to the sheets and use it to make aspics, molds, and desserts.